Since my first pizza attempt turned out so well, I’ve gone a bit pizza crazy. To be fair, the pizza dough recipe I used did make enough dough for at least four 12-inch pizzas. And I have to use it, right? Right. 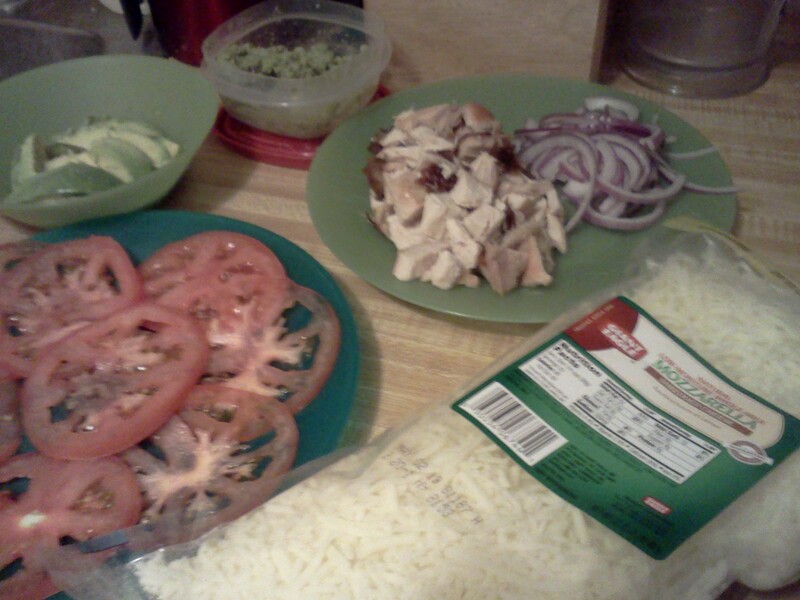 Here are the toppings I put together for my California Chicken Pizza: garlic scape pesto I made this spring and froze, a tomato, mozzerella cheese, some thinly sliced red onion and some leftover chicken. Plus, I sliced up an avacado and squeezed some fresh lime over the slices. The chicken/avacado/red onion combo always makes me think of California (hence the name), and I wanted something bright and summery tasting to offset the cold Ohio winter. Before I shaped the dough, I sliced the tomato really thin and salted the slices. I let them sit for a few minutes to draw out the moisture and patted them off with a paper towel. Nobody likes a soggy pizza! I would be more specific if I could, but I really don’t measure anything when I’m putting it on a pizza. I just pile it on until it looks right – pizza decorating is more of an art than a science., I guess. 🙂 I also thought I had taken a picture of the pizza before it went in the oven, but apparently not! Next time. It was a little easier to get the pizza from the pizza peel to the preheated pizza stone this time (but I still used a spatula for some help). I love that the bottom crust of the pizza immediately starts to crisp up when it hits the pizza stone. I sliced it up and topped the slices with the fresh avacado with just a hint of lime – it was delicious! It was light and summery and well… it just made me happy. You can’t ask for anything more than that! 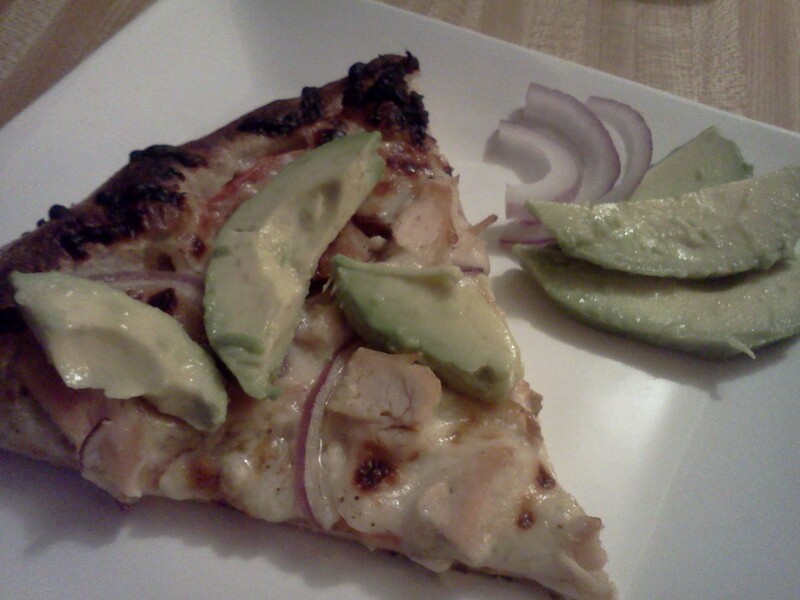 This entry was posted in Dinner, Pesto, Recipe and tagged avacado, chicken, garlic scape pesto, non-traditional pizza, pizza on February 8, 2013 by Melissa. Yum! I love fresh tomatoes, avocado and lime! I have never thought of putting them together on a pizza! I really think you are on to something really great here, Melissa! I definitely will try it. The pizza crust recipe I use makes enough for two big pizzas, and the dough keeps for about a week in a large ziploc baggie drizzled with olive oil on the inside. How do you store your dough? I dusted it with flour and covered it with plastic wrap in the fridge. It kept no problem for about 3 days – I didn’t try any longer than that. I froze a couple balls of dough as an experiement. We’ll see how those work when I thaw them out! Another wonderful looking, and I am sure tasty, pizza! Can’t wait for lunch today!!! I’m glad you and Laura could come help me eat it! I’m totally snagging this idea when I get tomatoes. And garlic scape pesto–what a great way to use my garlic scapes! Thanks! I freeze my oiled zip top bags of dough, then toss them in the fridge the day before I’m baking, and move them to the counter about an hour before I preheat my oven. I prefer the bags with a slide lock, and I usually keep a couple of gallon-sized bags in the freezer. But label them! I have no idea if the pizza I recently made was a butternut squash dough or an eggnog-squash dough because I didn’t label it. Spinach or pesto or beet dough looks different enough, but not the other types. Good tip – I haven’t made any flavored pizza doughs yet, but I can see where labeling would be important! 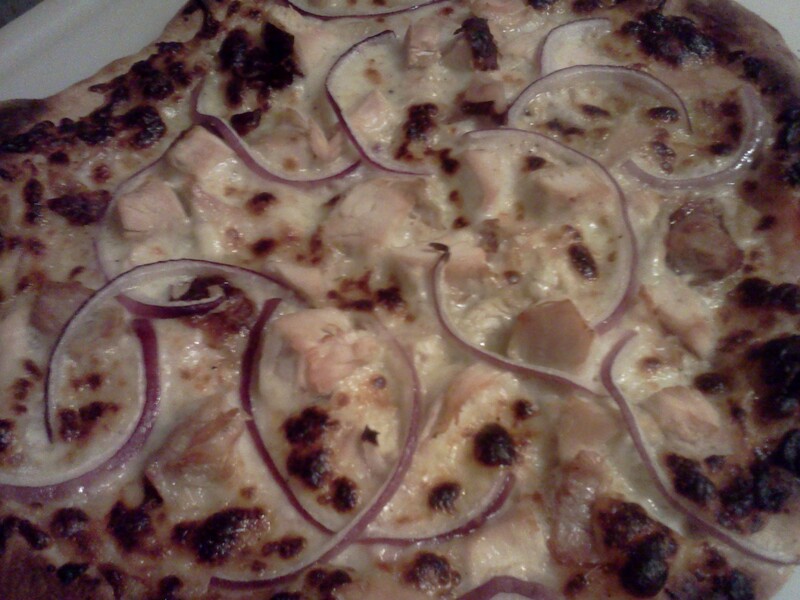 I love the look of this pizza!! It sounds fabulous, and of course you need to keep creating and then eating the same creations because there’s nothing worse than letting your crust go bad. You could freeze it like Ms. Kirsten does and be really economical and happy on a totally different day for having stashed away frozen pizza dough or you could splurge now. I say splurge now, but I’m a bad example. It’s like the old story about the ants. There’s one who parties all summer long and when winter comes practically starves because he didn’t work and set aside food in the summer. I’m the bad ant. I love that you are from Northeast Ohio and getting into having a CSA. Being a part of one is one of my favorite things, and it’s so nice to find a kindred spirit and one so close by. P.S. I think I saw the sun today in cold and blustery Ohio, and it was lovely. Thanks, Meghan! I did freeze some of the dough – I’m trying to be a good ant! I love being a part of a CSA, too. I can’t believe how many there are in Northeast Ohio! I’m looking forward to getting some great ideas from you and Kirsten this summer. It’s definitely a treat when the sun comes out this time of year!